Committee for a workers' International - Spanish State: Capitalism is killing the planet! The European day of educational strikes against climate change was a success at the international level. In more than a thousand cities and a hundred countries, hundreds of thousands of young people have raised their voices against the ecological catastrophe our planet is experiencing and against those responsible: the capitalists, the governments at their service and the big multinationals. "If the planet were a bank, they would have already rescued it." In the Spanish state, the student general strike and the mobilisations called at 12 noon by the Sindicato de Estudiantes in more than 30 cities were an overwhelming success. With more than one million students on strike and more than one hundred thousand young people in the streets shouting, 'If the planet were a bank they would have already rescued it! ', 'If they over load the planet, to the general strike!' and 'Their profits are killing the planet! ', we have made it clear that our struggle is serious. In Madrid, over 50,000 people packed the Puerta del Sol and began our march towards the Congress of Deputies. Another 10,000 in Barcelona filled the Plaça Universitat. There were 8,000 in Seville, thousands in Malaga, Vigo, Bilbao, Salamanca, Gijón, Granada, Gasteis and many more. The international movement against the ecological catastrophe to which this system condemns our environment has reached the Spanish State with force. This explosive day of strikes and demonstrations took place just one week after the historic 8 March feminist general strike, when millions of women and young workers, together with our male comrades in struggle, once again took part in a mass mobilisation against male violence, patriarchal justice and the oppression we suffer under capitalism. The ‘uprising’ against climate change is a reflection of the radicalisation experienced by young people on a global scale. The struggle to save our planet is becoming - in the same way as the fight against sexism and patriarchal justice - a channel of expression to denounce the impasse that the capitalist system represents for most of us. The same corporate monopolies and big banks and the governments at their service, that destroy our environment, also condemn us to cuts in public services, privatisation of health and education, trample on our democratic rights and condemn us to precariousness, miserable wages and massive unemployment. All for the same reason: to become even richer and to continue amassing juicy economic profits. Our planet is the victim of a devastating aggression. The continuous increase in temperatures, the pollution of the oceans, deforestation and the phenomenon of climate refugees (people who have to flee their homes and houses because of the consequences of climate change) are all multiplying at an atrocious rate. But this is not the product of some evil of humankind in the abstract. It is the result of a predatory system that bypasses the environmental needs of humanity to provide the profits of a handful of parasites. Faced with this situation, hundreds of thousands of young people denounce the massive hypocrisy of governments and politicians at the service of the great economic powers, who, while approving supposed protocols and agreements to "defend" the environment and against pollution (Kyoto, Paris...), legally protect the impunity of the big polluting companies who do not comply with them and nothing happens to them. That is why on Friday we chanted with all our strength: “The problem is the system!”. A non-partisan and apolitical movement? For an anti-capitalist and revolutionary campaign on the environment. It is very symptomatic that the system's media and some ‘Friday for a Future’ spokespersons who joined our mobilisation in many cities, have attacked the Sindicato de Estudiantes for our ideas and demands. 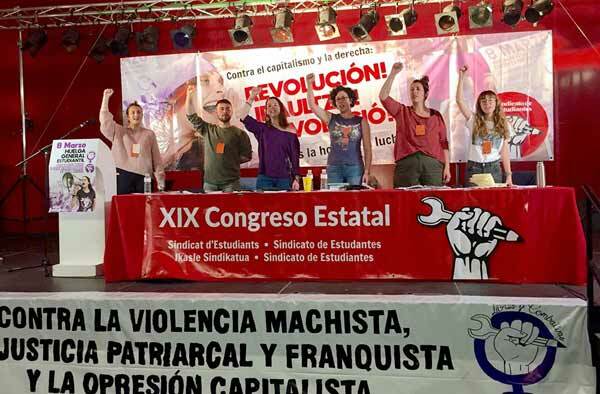 While in their statements they appealed for this movement to be "non-partisan" and apolitical, they praised the "ecological" policy of the government of Pedro Sánches. The television channels gave them publicity with reports showing them in the European Parliament being treated with much affection by the politicians present there, who also want to capitalise on this struggle of the youth. We in the Sindicato de Estudiantes do not agree that this movement should serve as a springboard for organisations and supposed NGOs that claim to be "green," but who later, when they reach parliaments or governments, collaborate with austerity policies, privatise public services and are even generously financed by the same polluting companies that they claim to denounce. We also believe that presenting this struggle as a generational conflict, between young and old, is a complete mistake and is part of a strategy to avoid pointing out the real culprits of the ecological catastrophe. Nor is it a rebellion in which we ask "politicians" in general to reflect, rectify and take action. To think that the representatives of this system, who today fill governments all over the world, will face the big multinationals in defence of the planet is simply ridiculous. We know that the answer and the solution are in the street and in mobilisation. It is no coincidence that the media, which hide and minimise the struggles of the youth and workers, try to mount a media spectacle to make this great movement harmless. We, the Sindicato de Estudiantes, understand that we will only be able to stop the climate degradation that the planet is experiencing by breaking with the capitalist system. We are not going to allow representatives of exploiters like Angela Merkel, Macron, Teresa May or Trump, nor social democratic politicians, who have also actively collaborated in the current environmental degradation, to try to wash their hands by capitalising on this movement while continuing to apply policies that roll out the red carpet for the big polluting companies so that they can continue to do as they please. The mobilisation for the survival of the planet is not separate from the other social and educational demands that we have fought for in recent years. We must build a great environmental movement that goes to the root of the problem and unites youth, workers and all oppressed sectors to bring about real change in society. That means to end the suffocating control exercised over world production by a handful of large multinationals and establish economic planning in a rational and environmentally friendly way, guaranteeing full employment, decent wages and public services and social justice. Only by ending capitalist oppression and building a genuinely democratic society based on social justice, a socialist society, can we preserve our wonderful planet and rid ourselves of the catastrophe that threatens us. - Nationalisation of all energy and fuel multinationals (electricity, mining, oil and gas, wind and solar energy companies, etc. ), and a public investment plan to establish a 100% ecological and sustainable energy industry. No to energy poverty! - For a free, quality and ecologically sound public transport network. A massive investment plan to make cities 100% sustainable. - Nationalisation of the automobile, aeronautical and naval industries and transformation of their production to make them viable and non-polluting. - Nationalisation of land, livestock and food processing industries. No to capitalist exploitation of the oceans. For a sustainable, ecological and healthy diet for the entire population! - Public recycling companies under the democratic control of workers. Stop making business out of ecologism! - For sustainable production, planned democratically by the whole working class and youth. For the socialist and ecological transformation of society. If the present is one of struggle, the future is ours! Join the Sindicato de Estudiantes!